To WormMail mailing list (recip. undisclosed). The latest edition is online. Armidale: ewes, WormTest average = 5124 strongyle eggs per gram (ranging up to 13 520). 100% Haemonchus. Northern New England: Lambs, average = 3080 epg. 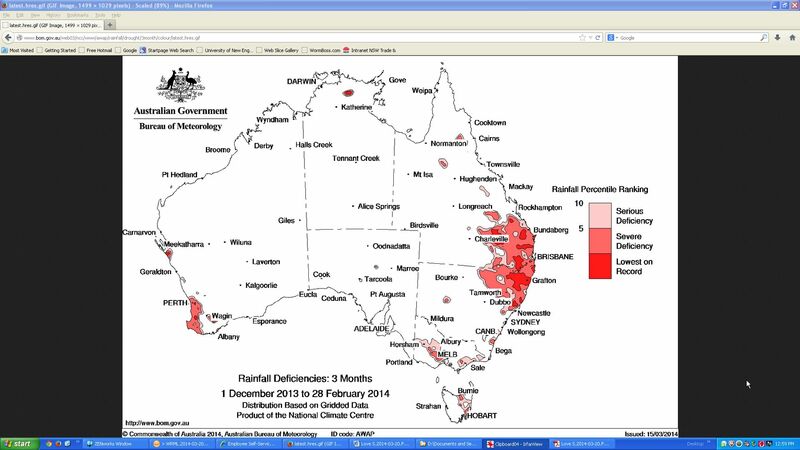 Bear in mind that the New England and North West regions of NSW (and elsewhere) have had record – or near record – rainfall deficits – for the last 3-9 months. So, even in droughts, worms can be an issue. And, on top of that, drenching unnecessarily when there are few worms in refugia (as in droughts) produces strong selection for drench resistance. Central North: Wethers, av = 2064 epg, Haemonchus81%, Trichostronglyus19%. Central West: Ewes, av =1552 epg, 87% Haemonchus. South East: Ewes, av = 7492 epg (highest: 18 800). 100% Haemonchus. Bayer Animal Health veterinarian Dr Neil Cooper has indicated he will be retiring soon from Bayer. At Bayer, Neil leads a team of veterinarians and technical staff. (http://farmadvisor.com.au/advisory-line). To all who know him, Neil is a consummate professional (skilled, experienced and ethical) and one of nature’s gentlemen (and, from all accounts, not a bad tennis player either). (For many years – and he still may be – Neil was the captain of the Lane Cove tennis club in Sydney). I first met Neil, a graduate of the Veterinary School, University of Sydney, when I was later a student in the same vet school. Neil was a tutor in veterinary surgery. Many years later I was re-acquainted with Neil when, on a work trip for Bayer, he visited the Regional Veterinary Laboratory, Armidale, where I was working. A very good people person, Neil remembered me as a student, and only had nice things to say (suggesting that, if nothing else, he is very charitable). As a NSW Agriculture veterinarian, I had the pleasure of working with Neil and colleagues from CSIRO (Emma Doyle (now with UNE) and Amy Bell) and others in ‘road shows’ across the state, speaking to farmers about sheep worm control. A ‘double doctor’ (having a vet degree as well as a PhD), Neil for his PhD studied among other things the effects of toxins on protein transport in axons. At the same time he managed Dr Antony Kidman’s laboratory in the Neurobiology Unit at the University of Technology, Sydney. Yes, Kidman, then a biochemist working on muscle therapy and related fields, is the father of Nicole Kidman. (Dr Kidman more recently has worked in psychology, and wrote the foreword to the book Learned Optimism, by Prof Martin Seligman, the ‘father’ of positive psychology). As a veterinarian and lab manager, Neil was able to assist the other team members in the UTS Neurobiology Unit with their animal research, as well as working on his own project. One of Neil’s colleagues hypothesised that the cause of Duchenne Muscular Dystrophy was due to a faulty membrane defect /component; he was subsequently proved correct. As an aside, and confining myself to internal parasites here, I will say Australian sheep producers have been lucky to have had naphthalophos (NAP)-based sheep drenches. Bayer’s ‘Rametin’ was the first (initially, I think, as ‘Bayer Management Drench’ (~ 50 mg active/kg liveweight), then ‘Rametin-H’, then ‘Rametin HLV’ etc) and, for decades, the only NAP drench available in Australia. Other countries, e.g. New Zealand, haven’t had access to NAP. Although it has to be used with extra care, given its relatively narrow safety margin (compared, say, to benzimidazole (BZ) and macrocyclic lactone (ML) actives), it has been extremely useful, especially in combination with other, unrelated actives, as an alternative to ML drenches. (H = Haemonchus (this product had a flat 7.5 ml dose). LV-low volume (a flat 5 ml dose) These ‘flat dose’ NAP products were efficacious against Haemonchus and, in smaller sheep, against Teladorsagia and Trichostrongylus also. The current Rametin dose rate, seeking to balance efficacy and safety, is approx. 35 mg/kg LWT). Neil and others published (Australian Vet Journal, vol. 47, 1996) the results of field trials assessing the efficacy and safety of NAP+BZ and NAP+levamisole combination drenches. The two things I took from that paper are that these NAP combinations were very useful and also that, where there were safety issues, they occurred in clusters i.e. on just a few properties (just one farm in Neil’s reported study), and not as a generalised occurrence. My own field experience confirms this: for example, several years ago one producer lost several ewes (that were pregnant and were being supplementary (grain-) fed for a protracted period ) after treatment with NAP, whereas in the same district another producer had used 10, 000 doses of NAP on sheep in the same year without a single loss. Regarding adult education and training, in addition to his work at Bayer, Neil has been on the Agsafe Board for the last 4 years. Agsafe runs the DrumMuster and ChemClear programs for Ag-Stewardship, as well as running a reseller training and accreditation scheme. Neil will likely continue doing that for a while. In case you were wondering, Neil is the brother of veterinarian and TV personality, Dr Harry Cooper. (Two talented brothers). However, we (in the worm- and related worlds) are much better acquainted with Neil, and are the better for it. We wish Neil and Ros and family the very best in the coming years. Doubtless Neil’s retirement (from Bayer) will be a very active and productive one. Further to the recent WormMail on Gordon et al ( http://tinyurl.com/wormail-hugh-gordon-archives ), Dr RB (Brown) Besier, a past president of the Australian Sheep Veterinarians Society, tells me that one of the society’s major awards is named after Hugh Gordon. (‘Brought to my attention by specialist goat veterinarian, Dr Sandra Baxendell, QLD). or http://tinyurl.com/scottish-scientists-fasciola (I produced this Tiny URL given the British proclivity for long web addresses :-). ‘Interesting that, in Britain, ‘dwarf pond snail’ is the common term for the lymnaeid intermediate host snail(s) for Fasciola hepatica. Lymnaeids apparently serve as hosts for at least 71 trematode (‘fluke’) species. Readers will be pleased to know that name-changes are occurring among lymnaeids as well. e.g. according to certain ‘cladograms’, Lymnaea tomentosafor example is now sometimes referred to as Austropeplea tomentosa. It could all be for good reasons of course. ( The traditional nomenclature apparently has been based more on phenotypic resemblances than on evolutionary and phylogenetic considerations). Curiously we modern humans are still referred to as Homo sapiens. I thought the ‘sapiens’ bit, for example, would have been challenged long ago… 🙂 (Homo sapiens: literally, ‘wise man’ (Latin)). clade: a group of organisms believed to comprise all the evolutionary descendants of a common ancestor. Example of use: ‘the great ape and human clade’. Origin, 1950s, from Greek, klados: ‘branch’ phylogeny: the evolutionary development and diversification of a species or group of organisms . (Gk: phule/phulon: race/tribe + geneia: be born, become). Compare with ontogeny: the development of an individual from earliest stage to maturity (Oxford Dictionary). (1451–1506), Italian-born Spanish explorer, credited as being the first European to reach the Americas; Spanish name Cristóbal Colón. Columbus persuaded the Spanish monarchs, Ferdinand and Isabella, to sponsor an expedition to sail across the Atlantic in search of Asia and to prove that the world was round. In 1492 he set sail with three small ships and reached the New World (in fact various Caribbean islands). He made three further voyages between 1493 and 1504, reaching the South American mainland in 1498. I suppose all cultures have, as part of their culture and traditions, hagiographies that are not always well-grounded in fact? I was going to write a short WormMail, but didn’t have time, so I wrote a long one instead. (with apologies to Mark Twain). The fattest knight at King Arthur’s round table was Sir Circumference. He acquired his size from too much pi. Attached (as a low-res PDF; ~ 11 mb) is a compilation of old images and notes that relate mainly to the famous Australian veterinary parasitologist, Dr Hugh McL Gordon. This is from wikipedia but I first saw it in a book by R Koch, “The 80/20 Principle”, (which builds on the Pareto Principle). “I divide my officers into four groups.